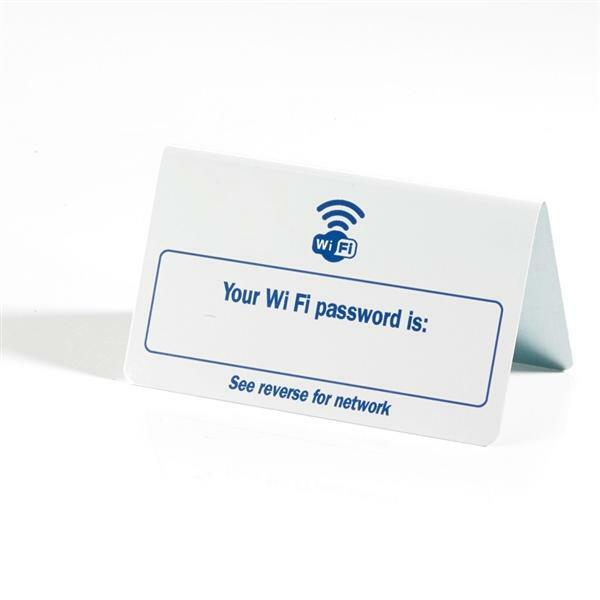 Now you can tell your guests your WIFI network name and password with this tent sign that will take water based marker pens for wiping off to change the password or a permanent marker to avoid accidentally erasing. The sign does not say FREE leaving you the option open. Excellent. Good heavy and solid plastic. Space for wifi connection name on one side, and the password on the other. Wonderful Idea - but I used a labelling tape (black on clear) to mark these up as that is much neater and does not smudge. Wish these had been around years ago as I am always forgetting the password!